Nikon updated its popular 18-200mm zoom lens in July of 2009, responding to feedback from its customer base. The lens doesn't appear to have been redesigned, but rather tweaked in small ways. In particular, the new lens uses rounded diaphragm blades to make up the aperture, includes a 'Super Integrated Coating' to reduce flare and ghosting, and adds a zoom lock switch to address persistent issues with zoom creep. The lens takes 72mm filters, ships with a petal-shaped lens hood, and is available now for around $800. One of the areas of improvement in the new lens is sharpness, producing slightly better results than the previous version of the lens. Wide open at 18mm, the lens produces images with a generous sweet spot of sharpness, around 1.5 blur units through the middle of the frame. The sharpness degrades slightly towards the corners, where we note around 2 blur units. Stopping down offers only marginal improvement, both in the corners and the center of the image, until we note maximum sharpness at this focal length at ƒ/8. 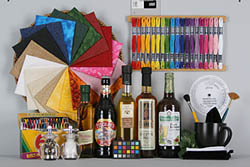 At this point central sharpness is still sitting at around 1.5 blur units, but the corners are just a hair under 2 blur units. Mid-range performance is much improved over the previous version of the lens. Between 24 and 70mm, at the widest aperture settings, central sharpness rests at between 1.5 and just under 2 blur units, while corner sharpness (similarly to the previous version of the lens) varies between focal length setting. At 35mm it is particularly noteworthy, showing upwards of 5-6 blur units, but at other focal lengths between 24 and 70mm it's relatively innocuous - around 2-3 blur units. Stopping down to ƒ/8 offers great improvement, taming the corners dramatically, and producing average performance of between 1 and 1.5 blur units. For maximum sharpness I would set this lens to 50mm and ƒ/8. Telephoto performance at 135mm and 200mm is still the weak point for this lens, but again, it is somewhat improved over the previous version. By these focal lengths the maximum aperture setting is ƒ/5.6, which makes the vibration reduction setting all the more useful. In terms of results, at 135mm we note a small sweet spot of sharpness in the center of the image at around 1.5 blur units, which softens quickly to around 3-4 blur units at the corners. At 200mm this effect is similar but the sweet spot is smaller. Stopping down in both cases produces marginal gains, more so at 135mm than 200mm, but not much. Fully stopped-down performance isn't bad, producing images with around 2-3 blur units. At 200mm however, we note results in the range of 4 blur units. Performance for chromatic aberration is virtually unchanged from the previous version of the lens. On a body with automatic chromatic aberration reduction CA would probably be dramatically reduced, but on our D200 test body, we note fairly high CA results at the wide (18mm) and telephoto (200mm) extremes. At other focal lengths, CA is well-controlled. There isn't much difference between aperture settings at the wide angle, but at 200mm, smaller apertures produce slightly more CA, with the worst results at ƒ/36. Results for light falloff appear to be virtually identical between the previous and current versions of the 18-200mm ƒ/3.5-5.6. Corner shading is present but not overly problematic, with the worst results showing at 18mm and ƒ/3.5. Images produced with these settings show corners that are over 3/4 EV darker than the center. To get images with only marginal corner shading, you'll have to stop down to at least ƒ/8, or (interestingly) shoot at 24mm or 35mm, where light falloff doesn't appear to be an issue. The complex array of lens elements that allows such a vast range of focal lengths in one lens leads to some dramatic results for distortion. When used in the wide angle configuration, the lens provides uniform barrel (''bloat'') distortion up to around 21mm, with noteable distortion in the corners at 18mm (+1.2%). After 21mm, distortion across the frame remains consistently barrel-distorted, but at a moderately low level (around 0.25%, on average) and the extreme corner distortion turns into the pincushion (''squeeze'') style. The worst results are seen between 24mm and 50mm, where the corners show -0.75% pincushion distortion. As an AF-S lens, autofocus operation is quick and virtually silent. The 18-200mm will work on all Nikon camera bodies that support SWM (silent wave motor) lenses. Autofocus results can be overridden at any time by simply turning the focus ring. The lens isn't rated for macro, but that said it's not bad either: a magnification of 0.22x (1:4.5 reproduction), and a minimum close-focusing distance of 50cm (just over 18 inches). The Nikon 18-200mm ƒ/3.5-5.6 is a built with a durable plastic construction, finished with a matte black texture. The lens mount is metal and the 72mm filter threads are plastic. The lens comes with a petal-shaped hood. The lens features a switch to disable autofocus (''M/A - M'') and a distance scale marked in feet and meters, located under a clear plastic window. There are no depth of field markings, or an infrared index mark. As a G-series lens, there is no aperture ring. The lens also features seven rounded aperture blades. Two other switches are present, one to enable or disable vibration reduction, and one to select the style of vibration reduction required: active (4-axis) or normal (2-axis, on the horizontal plane). The zoom ring is the larger of the two, mounted towards the end of the lens. The ring is 3/4-inch wide, made of a tactile rubber, and surfaced with raised ribs. The zoom ring is nicely cammed: it takes two fingers to move the ring. At 200mm, there is significant lens extension, as the lens doubles its length from around 3 1/4'' to just under 6 1/2''. Zoom creep was a widely-reported problem for this lens, more so as the lens aged. Accordingly, Nikon has included a zoom lock switch, which when selected locks the lens to its 18mm position. The focus ring is plastic, just 3/8'' wide and textured with raised ribs. The ring is mounted closer to the lens mount. The ring takes about ninety degrees to run through the focusing range, but there are no hard stops at infinity or close-focus; rather, there is a slight increase of resistance to let you know you're at the end. There is some additional room at infinity to allow for focusing at different temperatures. The front element does not rotate during focus or zoom operations. While I can't give you definitive numbers for the VR performance of the 18-200mm (Nikon claims up to four stops of improvement), I can tell you it does offer improved performance in controlling camera shake. The VR employed in the 18-200mm hasn't changed from its predecessor design, offering only one setting for VR (on and off). When set to ''normal'', the system allows for panning shots which compensate for vertical shake only; in ''active'' mode, the system compensates for movement in all four directions. The petal-shaped lens hood reverses onto the end of the lens for storage; the interior of the hood is a smooth, matte finish. 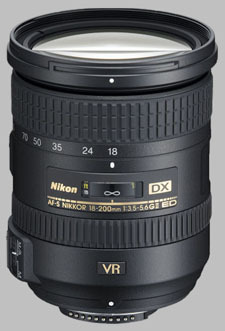 Nikon 18-200mm ƒ/3.5-5.6G IF-ED AF-S DX VR Nikkor ~$? Now discontinued, the original 18-200mm is still a capable lens, and perhaps one unintended advantage inherent in the release of version 2 is that used copies of version 1 will now hit the market, and dealers will be selling off copies of their old stock. While technically not as sharp as the newer version, the differences are minor, and in terms of performance in the categories of chromatic aberration, light falloff and distortion, the two lenses are virtually identical. Sigma's offering in this category is comparable in the wide and mid-range of its focal lengths, but after 80mm, the Sigma isn't nearly as capable as the Nikon. Stopped-down though, it's not bad. To its credit, the Sigma offers much less corner shading, though chromatic aberration is more problematic. Results for distortion are almost identical. Sigma also produces an 18-200mm OS lens. Tamron's 18-270mm lens holds the crown (at time of writing) as the travel zoom with the widest range of focal lengths. The Nikon is slightly sharper wide open, but stopped down, the Tamron is just as capable. Results for chromatic aberration are impressively low at wide-angle and in the mid-range, but at telephoto, CA is significantly high. Light falloff is better than the Nikon, but distortion is slightly worse. Nikon hasn't re-invented the 18-200mm ƒ/3.5-5.6 VR2 (II), but they've made some useful tweaks, addressing some complaints that have dogged this lens since it was first introduced. For its size and price point, it makes an excellent all-in-one lens. Just picked one up and I don't know why I'm even surprised about the lens creep. Seriously?! Haven't they had at least 7 years to fix this? Not feeling it from Nikon lately. quite a bit tighter barrel than my vr I and sharper. 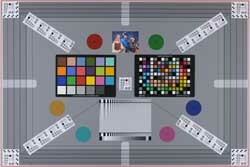 have had a VRI for some years on D80-90-7000 cameras. decided to have a backup setup and purchased the VRII from 42nd. This VRII is sharper and tighter than the old model. Actually, my sample VRII is very sharp, and using the in camera D7000 distortion control you can clean up the only weak area of the lens. i traded in a 16-85 which was sharper than VRI and equal to VRII. There are sharper lenses but not really more convenient ones. I have an 80-400 which if you can hold it still shoots better, but you get one good shot out of 5. The VRII nails it every time. the lens also is a lot less sloppy in the barrel when zoomed to the 200 mm position. i looked at tamron and sigma, the nikon has a bigger 72 mm objective and the others are smaller. i thought the tamron 18-270 might be as good, but the focus is nowhere near the nikon system. the lens is not quite sharp enough at the edges to reach d7000 limits. but on the other hand i have 4 meg pix photos that still look great. it's about color, not always about sharp pixel peeping details..
Definitely not a successful replacement for Vr I edition. Zoom lock doesn't help much at 18mm, eitherway the lens doesn't have any creep there. I was very pleased with my Vr I edition and i regret for it;s sale....maybe it was softer but it was decent at all frame. What bothers me here is the old lens gets over an 8 in image quality and this lens gets over a 7, but the new lens is said to be better in image quality. also the old lens gets a better overall rating. To the question about why this lens is rated lower than the original, that's for several reasons...when this lens first came out there wasn't much competition, the Tamron 18-270VC wasn't available, the only choices were the Tamron 18-250 *without* IS and the Sigma 18-200 for Nikon-mount (which also is a dog away from F8 and uses really-poor glass in my opinion). There also wasn't a Nikon fullframe so there wasnt a Nikon match for the Tamron 28-300 (which doesn't have IS but is a nice, decently-sharp superzoom). So there weren't any real options other than to get this lens if you wanted a superzoom for a Nikon camera and thus it was rated against nothing for quite a while. The only real competition for the combination itself was the Tamron 18-250 on the Sony subframe, either an A100 or A700, and Sony really screwed the pooch there for a while with cooked-raw (but that combination is what exposed the weaknesses of this lens for me). I think that people were happy to get a decent Nikon superzoom for subframes (and remember that was their entire market back then), as they were at least able to get shots with it over a wide focal-length range (which you have to admit does count for a lot, especially with a DSLR), and then over time as they shot the lens and compared the results to what they got with other lenses on the same cameras and other lenses on different cameras (like, the Tamron 18-250 on any Sony with body IS, the Canon 18-200 EF-S IS on a Canon, etc, shorter-throw zooms that are sharper) they realized just how bad a lens it is. And of course some did not expect much out of it compared to say a $1500 zoom or a prime, and some did not really know to expect more, and some didn't care to update their review. So the early lens was rated against the absence of any real competition, this new lens is definitely rated in the face of stiff competition. I still say that the new one may be great for you, so you should at least buy it and try it if you are at all interested in this lens. Get it and the Tamron 18-270VC and have a shoot-off. I got a lot of good shots out of my 18-200 when I had one, but I got sick of the blurry fine-detail and feeling that I had to shoot it at F11, tried the Tamron 18-250 on my D300 and never looked back. I have not bought a non-Tamron lens since. You want an extreme comparison, try shooting a landscape scene of decent complexity and fine-detail with a Tamron 18-250 on a Sony A700 at low ISO and compare it to any Nikon subframe with this lens. Shoot 'em both raw, using the same lens settings & the same focus-point, even use the old V3 bios on the A700 and your favorite raw-converter. Just for fun try using a tripod. The Nikon combo will give you better color and maybe a touch-better focus, but the Sony/Tamron combo will give you 50x more fine-detail even using the old v3 cooked-raw bios with a lot less geometric distortion. Below ISO800 it won't even be close, at ISO800 and above I'd prefer the Nikon combination simply because at high ISO fine-detail is already lost to noise anyway, especially in a subframe and I'm probably shooting wide-angle wide-open anyway & neither lens is going to be sharp across the frame then. But with the Tamron 18-250 I can get decently sharp shots at F5.6 not to mention F8 and it never sees F11 in my hands. The Nikon 18-200 pretty much starts to be "ok" at F8 and needs to be shot at F11 to get it to be flat-sharp across the frame away from say 50mm on the lens. Even then it just does not get "sharp" in my opinion. Sure I could ue DxO or Bibble lens-correction which definitely helps, but still the Tamrons are *way* easier to shoot in my opinion, but to be fair, you really have to try these things for yourself to know for sure. As long as it's a plausible candidate for your bag. Everyone has an opinion. Nice travel zoom lens. Light and compact (when collapsed). Very impressive image quality for a superzoom, exellent VR performance.